We’ll have a table at Shore Leave 34 in Baltimore, MD August 3-5. 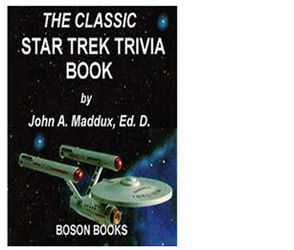 We’ll be showcasing all of our Boson sci-fi, including giving away 10 free copies of “The Classic Star Trek Trivia Book” (John Maddux). Other featured authors will be Chris McGowan, Frank Almond, and Atk. Butterfly. We’ll offer books in print as well as on USB keys in all e-reader formats, DRM-free. Early registration closes July 15. Tickets are sold at the door, but limited to 1500 participants. Registration can be found here.